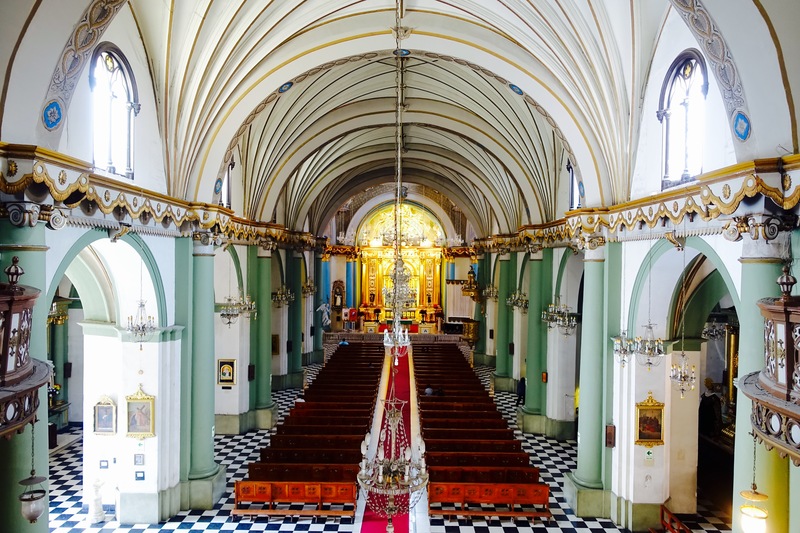 Lima is also known as the “City of Kings,” because Francisco Pizzaro, the Spanish conquistador, founded the city in 1535 on the Catholic holiday of Epiphany, the day when the three kings visited the baby Jesus. Pizzaro was also the one who established the location of the Plaza de Los Armas, our next stop. He did this to follow a mandate set by King Charles I of Spain in 1523, Procedures for the creation of cities in the New World. It required that, after outlining a city’s plan, growth was to radiate outward centered on the square shape of the plaza. 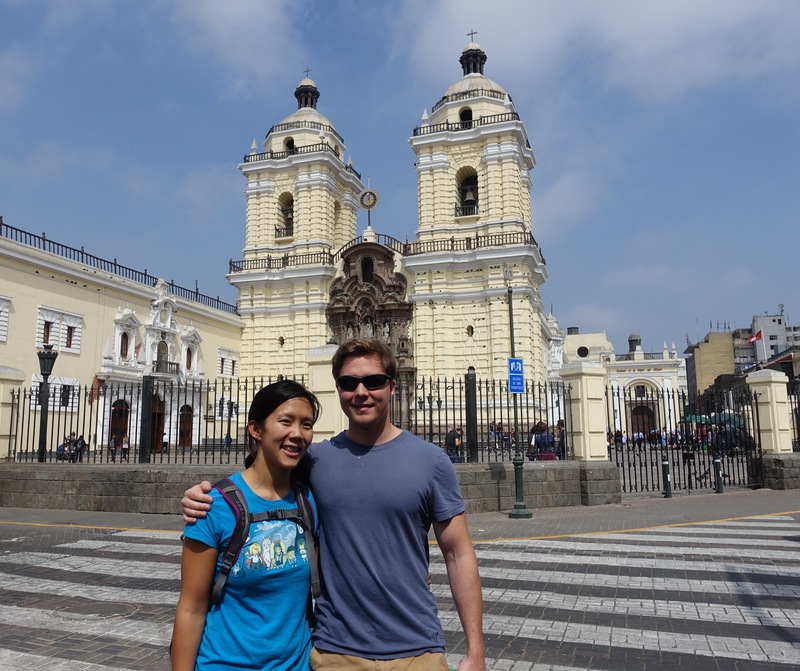 Our guide then pointed out some key buildings surrounding the square including the Lima Cathedral, Archbishop’s Palace, Municipal Palace, Congress of the Republic, and Presidential Palace. (I’ll write more on these later as I’m hoping to find the opportunity to visit the interior of some of these buildings). 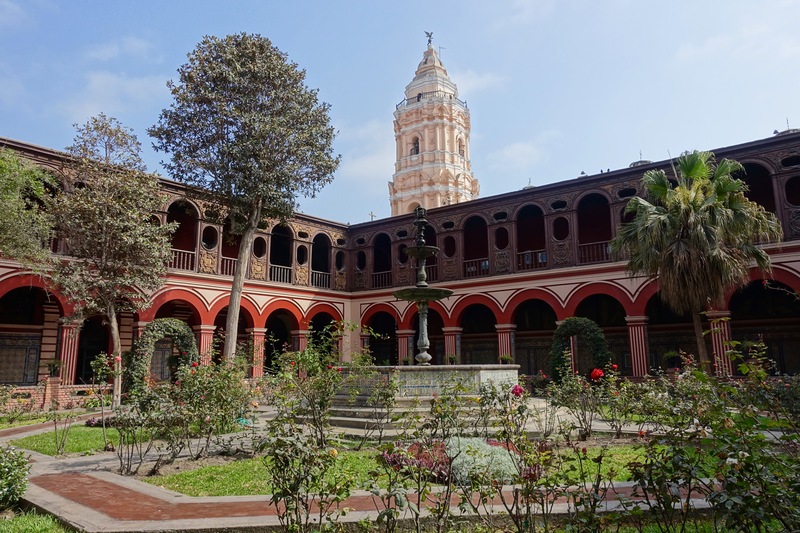 We then strolled through the Peruvian Gastronomy House, visited the interior of the Saint Dominic Church, stopped in Post Office Alley, and paused to view the Rimac River. The tour finished off with a sampling of four different varieties of Pisco, the national drink of Peru. (To be honest this free walking tour was less enjoyable than others that we have taken. The first guide felt cold and stand-offish, and the second kept having to switch between Spanish and English, so I felt that the information and history got lost in his ﻿struggle). We were able head back to visit the interiors of the Church and Convent of Santo Domingo. And for only 10 soles, I’d say that it was worth it! As usual, Tom got frustrated with my habit of excessive picture taking, but I couldn’t stop myself. I’m entranced by the concept of cloisters, and how an individual can have so much faith that they devote their entire lives to an order; In this case, the Third Order of Saint Dominic. After our first day with lots of walking (or training our cubicle feet to evolve into travel feet with 20,000 steps per my FitBit), we were both exhausted and starving. After some debate we settled on visiting La Lucha Sangucheria for dinner which was conveniently just around the corner from our hotel. They are known for their juicy Chicharron Sandwhiches and man was I a happy panda! The roll was crispy on the outside but soft on the inside and the Chicharon was just the right amount of juicy on top of a bed of sweet potato and topped with lime marinated onions. It was soooo incredibly tasty. (Tom got a shredded chicken sandwich which he really enjoyed as well). We also split a Chicha Morada between us. It’s a traditional Peruvian Drink that is made from Purple Corn.